I was/am a huge B5 fan so much so my prize possession is my #1 comic signed by as many of the cast as I could get including JMS himself. I recently watched all 5 seasons and decided to read the books again as well. The first 3 stories are good but you do need to know who the characters are or you become a bit lost. The authors try to allow those readers who haven't watched any of the show to jump in but it's not enough and seems to lose some of the flow of the story. Since I know the show it was no problem for me to jump right in and I found myself actually reading in the voice of the characters who played them. Each story was quick and easy but the best would have to be Blood Oath. Perhaps it's because G'kar was my favorite character but the story was quick and didn't seem to waste too much time trying to catch the reader up on what was going on. 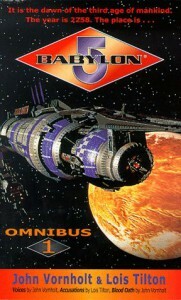 The Babylon 5 world was rich with great characters and a great setting that had so much more potential than was realized. This should have been another Star Trek world but failed to meet that potential, maybe it was too early for something like this. But if you know the characters the short stories and the books allow more details into that world.